John Street will be transformed tomorrow night and for the rest of the summer. Metrolinx, the City, and the Urban Land Institute will be stringing lights, adding street furniture, and planting flowers to start the process of revitalizing the corridor. This street furniture installation, which will remain throughout the summer, will be constructed in the afternoon and early evening of Friday, June 15. Urban Arts Community Arts Council (located on John Street) will be painting the pavement with colourful graphics to enliven the area. Everyone is invited to the grand opening and flower planting from 4 to 8. When John Street closes at the rail line, the two sections will be linked by a footbridge. Metrolinx would like your input in selecting the bridge and have narrowed the choice down to the four contenders presented below. The bridges will be discussed in detail next Saturday March 3rd at the Active Living Centre, 1901 Weston Road between 10am and 2pm with a presentation at noon. 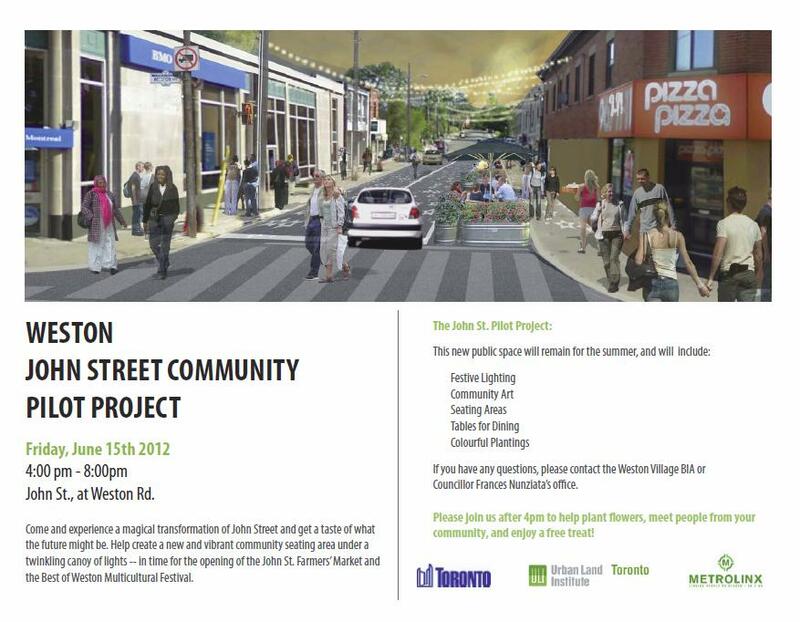 You can also review the design concepts by visiting their community office at 1631 Weston Road (416-241-2300). Scroll down for the feedback link. If you can’t make the meeting, feedback is possible through this link.